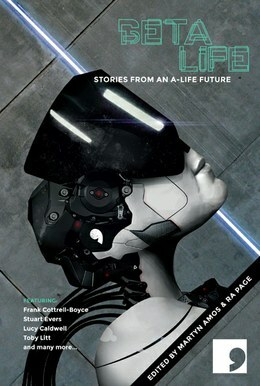 Beta Life Edited by Ra Page & Martyn Amos. Featuring Stuart Evers, Frank Cottrell Boyce, Martyn Bedford, Adam Marek, Margaret Wilkinson, Robin Yassin-Kassab, Adam Roberts, Sarah Schofield, Toby Litt, Sean O’Brien, Zoe Lambert, K.J. Orr, Julian Gough, Dinesh Allirajah, Annie Kirby, Lucy Caldwell, Claire Dean, Andy Hedgecock & Joanna Quinn. Computers are changing. Soon the silicon chip will seem like a clunky antique amid the bounty of more exotic processes on offer. Robots are changing too; material evolution and swarm intelligence are creating a new generation of devices that will diverge and disperse into a balanced ecosystem of humans and ‘robjects’ (robotic objects). How exactly they will impact on our world is still an open question. But in the spirit of collective intelligence, this anthology brings together 38 scientists and authors, working in pairs, to imagine what life (and A-Life) will look like in the year 2070. Every kind of technology is imagined: from lie-detection glasses to military swarmbots, brain-interfacing implants to synthetically ‘grown’ skyscrapers, revolution-inciting computer games to synthetically engineered haute cuisine. All artificial life is here. From Kandahar to Sarajevo, the forests of Lithuania to the boot camps of the DRC, Zoe Lambert’s stories weave a dark and disturbing web, interlacing documentary accounts with imagined testimonies to give voice to the many silenced casualties of war: an elderly woman on a bus tells a love story drawn from the depths of Soviet history; a soldier returns from his first tour of duty unsure he deserves his hero’s welcome; a Norwegian immigrant pieces together a family history fractured in the aftermath of Nazi occupation. Individually, these stories bear witness to a thirst for conflict that seems both unquenchable and foreign. But together, they bring the question of collusion and responsibility all the way back to the reader’s own doorstep. Includes stories by Alison MacLeod, Graham Mort, Zoe Lambert and Rod Mengham. There’s an interview with Steven Millhauser, plus artwork by Oona Ratcliffe. Like the creation myths they supersede, the revelations of science are seared into our collective imagination through storytelling. From Archimedes’ bath to Newton’s apple, vivid accounts of scientific discovery help us understand the principles behind each theory, and add to the larger narrative of how the universe works, and how we came to be here. 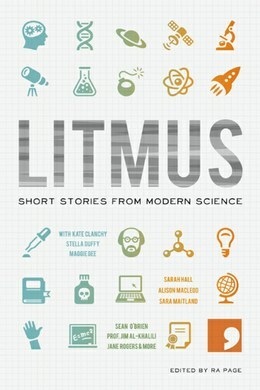 This anthology draws out and distills science’s love of narrative from a wide range of scientific disciplines, weaving theory into very human stories, and delving into the humanity of theorists and experimenters as they stood on the brink of momentous discoveries: from Joseph Swan’s original light-bulb moment to the uncovering of ‘mirror neurons’ lighting up empathy zones in the human brain; from Einstein’s revelation on a Bern tram, to Pavlov’s identification of personality types thanks to a freak flood in his St Petersburg lab. 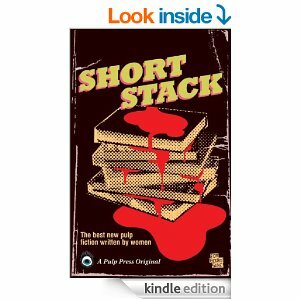 Featuring stories from: Shelagh M. Rowan-Legg, Donna Moore, Bernadette Russell, Jane Osis, Zoe Lambert, Icy Sedgwick, Evangeline Jennings, Gill Shutt, Claire Rowland and Mihaela Nicolescu. A bank manager arrives at work one day to find himself the new employer of his ex-wife. In the middle of a shift a divorced bus driver abandons his vehicle, to search for his estranged son. Two sisters come to terms with their father’s disappearance with the help of a skeleton called Indira. The stories in Ellipsis 2 explore the inherent dysfunctionality of almost all relationships, their aftermaths, and the lengths people go to to redeem them. 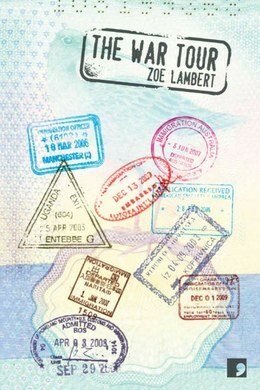 From the ingrained resentments of Jane Rogers’ parent-child histories, to the twisted claustrophobia of Polly Clark’s couples, and the absence that travels beside each passenger in Zoe Lambert’s bus sequence – these stories demonstrate the transforming, often alienating affect a relationship can have on the individuals in it, and remind us that being next of kin isn’t always kind. Ellipsis is a unique series presenting linked or themed sequences of short stories by three writers in each volume. 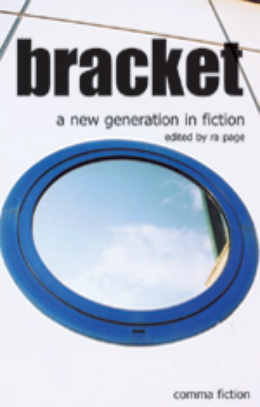 The latest in Comma’s acclaimed series of short story anthologies, Bracket brings together 20 of the country’s most promising, previously unpublished writers. From the cliffs of Flamborough Head to high rise, inner city madness; from lost loves to the last days of civilisation – the settings and scenarios in these stories captivate and unsettle in equal measure, all the time striving for that most unlikely modern thing, intimacy. 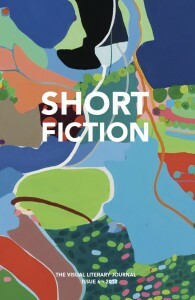 “Short fiction is in good hands” – Independent on Sunday, 13 Mar 2005. 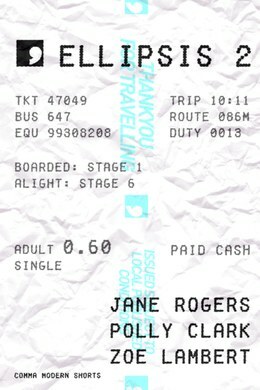 “Fills you with hope for the form” – Time Out, 2 Feb 2005.